Fixed a 3D touch regression introduced in the previous update. Tappd That is your Untappd companion. Take your complete beer check-in history and wish list with you wherever you go, even without a cell signal. Search your distinct beer list instantly. View and comment on your friend's check-ins. On top of all that, enjoy the world's fastest Untappd check-in experience, from your iPhone, iPad, Apple Watch, or HomePod! Search for new beers and check in to your favorites right from your wrist! You can see how close you are to your next distinct beer badge with watch complications. Works with LTE! Quickly send your recent check-ins to your friends in iMessage. That was an awesome märzen you had last fall, but now you're in the store a year later and can't remember just which brewery it was from. Type a few letters into Tappd That and view your ratings, all without an Internet connection. Want to see what your friends are drinking? Tappd That has you covered with the Activity view. You can toast your friends and comment on their check-ins, all from within Tappd That (activity data is not stored offline). 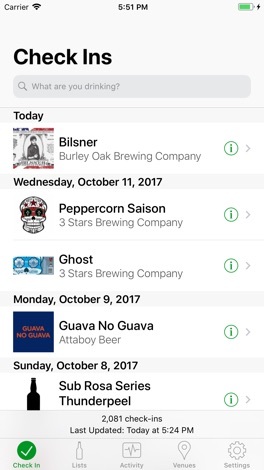 Don't be the only Untappd user struggling to find bandwidth to pull up your wish list at GABF. Save your wish list to Tappd That to have instant access to the names of those brews you really want to SAVOR. Want to add or remove a beer from your list? Do a search and swipe half-right. 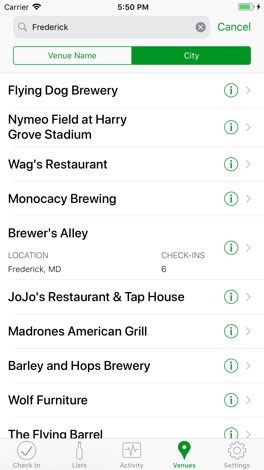 Your wish list will be updated immediately and synced to Untappd. Not only is your personal beer history available offline, but you can add to your list as well. 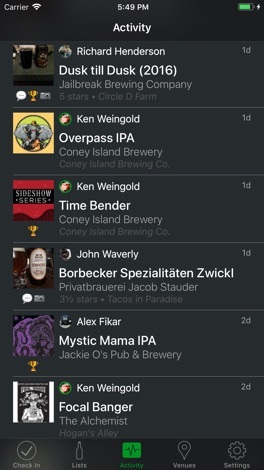 Check in to any of your offline beers, or search Untappd for a new one. With just a few taps, that beer in your hand will be logged. Tappd That can even attempt to guess your location based on previous bars you've visited. All that data is saved and available to search immediately offline. Even add to your check in list with your voice assistant. If you've had a beer before, just swipe it to the right and you're automatically checked in. That's right, NO TAPS! 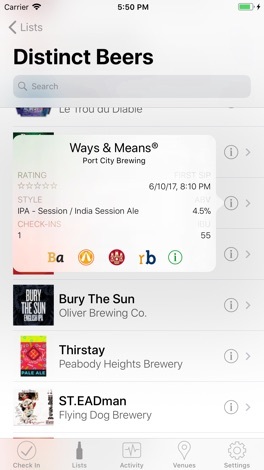 Tappd That will even allow you to rate the beer with a swipe and automatically guess your location. Seriously folks, this is the fastest check-in experience you could imagine. From zero to drinking in less than a second. Want more information about a beer? Details from Beer Advocate, RateBeer.com, BreweryDB, and Untappd itself are just a tap away! Do you remember all the beers you had at the alehouse with 90 rotating taps? You probably don't, but Tappd That sure does. Search venues by city and quickly browse all beers consumed on the premise, based on your check-ins. Check into those beers again with an additional tap. Let's face it -- a lot of the beer apps out there aren't very attractive on your phone. Tappd That strives to look good, be a good iOS citizen, and give you functionality you can't find anywhere else. This is an app I personally use every day, so I hope it can become a staple in your life too as you explore craft beers. Tappd That can sync all of your data, but it may take a few hours. Untappd only allows 100 "requests" per hour from third-parties. A request consists of ~50 beers. After 100 requests have been received, Tappd That's access to your Untappd account is suspended for an hour. If you have a large amount of data, you will not be able to download it all at once. Tappd That will pick up where it left off when you come back after an hour. Have questions? Please follow @TappdThat on Twitter or visit https://tappdthat.com to e-mail me. You can also get in touch with me through the Settings tab within the app. I'm more than willing to help! Cheers! The EstrellaTV App features the best video clips and segments from the EstrellaTV network highest rated shows and continuous entertainment and national news videos. This App also features 13 live Latin music radio stations and a list of events near you. Download this App and enjoy the best entertainment from EstrellaTV at the tap of your finger.